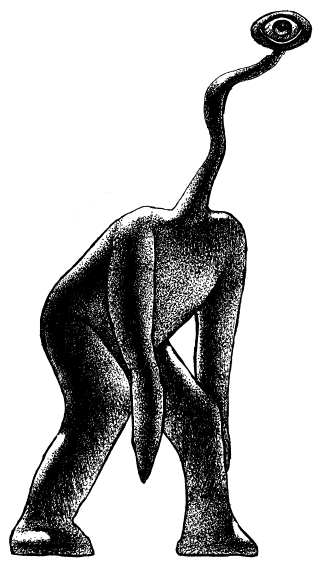 I found a great old illustration of “Baluchor” from an old Halloween advertisement via James Lileks’ Bleat and thought it would make a great demon prince. 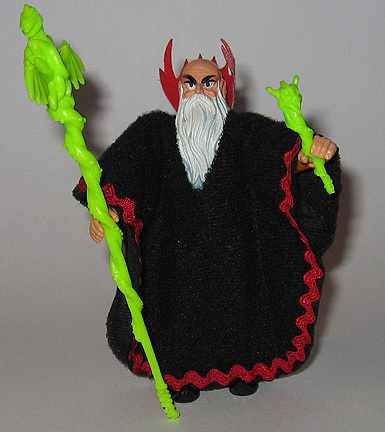 Baluchor is the demon prince of evil Astral creatures, paid fearful obeisance to by the kith-yin, mind blasters, night hags and nightmares. Baluchor’s antennae can pick up mystic vibrations (detect good, detect magic) and thought waves (E.S.P.) in a 60′ radius (always active). 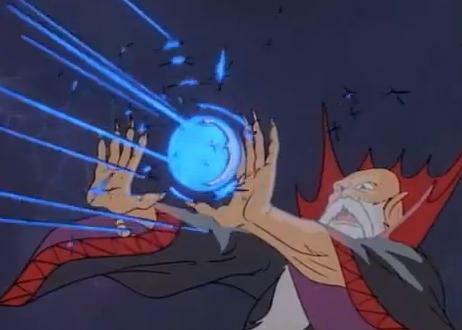 When Baluchor rolls a natural ‘20’ on a claw attack while on the Astral Plane, he automatically severs a creature’s astral thread (if applicable). Three times per day he can open a portal to the Astral Plane or a portal from the Astral Plane to another plane and, in the same round, use his telekinesis ability to attempt to push a creature through it. Baluchor’s hairy body is host to numerous pests and parasites, so those in melee contact with him for more than 3 rounds must pass a saving throw or contract a disease. Three times per day, Baluchor can summon 1 nalfeshnee or 1d2 marilith demons. Once per day, he can summon 2d8 kith-yin, 2d6 nightmares, 2d4 mind blasters or 1d4 night hags. 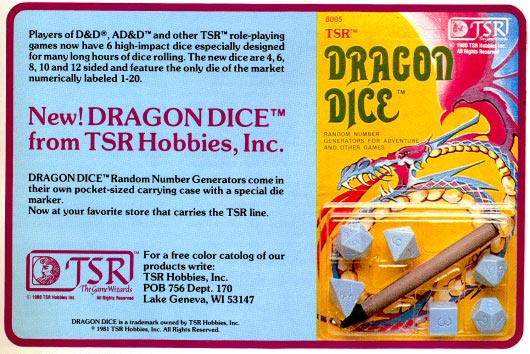 Has it been that long since the last Dragon by Dragon? Time flies and time is tight, but there should always be time to travel down through that great gaming oak to the roots and ferment in the brew of our elders. What the hell am I talking about? The bourbon is doing its job. 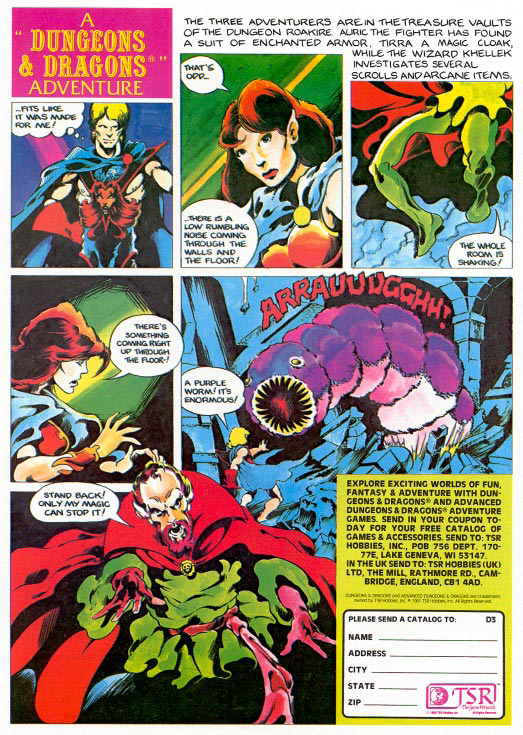 Let’s get started on issue 54 of the venerable Dragon and see what inspiration we can pull from this issue. Yeah, this will be less review and more “what’s cool that we can use today”. The druid enchants a woodland with terrible phantasms. When one approaches the woods proper, the trees loom over them and seem to animate, with grotesque faces and bony claws. Creatures with fewer than 3 HD must pass a saving throw vs. fear or be frightened away. Those who are not afraid initially may plunge into the woods, but things grow worse before they get better. With each step, a save is required for creatures one additional HD higher (i.e. one step in and creatures with 4 HD must save, the next requires creatures with 5 HD to save, and so on). If a creature becomes frightened, all creatures with fewer HD must save again. As one moves deeper into the woods, the wind whips up, the owls hoot, the foliage closes in and becomes more noisome … until one has gone 10 paces in, when the illusory magic ceases and the woods become normal once again. 1. Give the players a map showing the perimeter of the ruins, with credit going to the party thief. This saves time, and doesn’t give too much away. 2. Go through the map and decide which buildings are monster lairs; don’t determine what the building actually is until the players investigate. 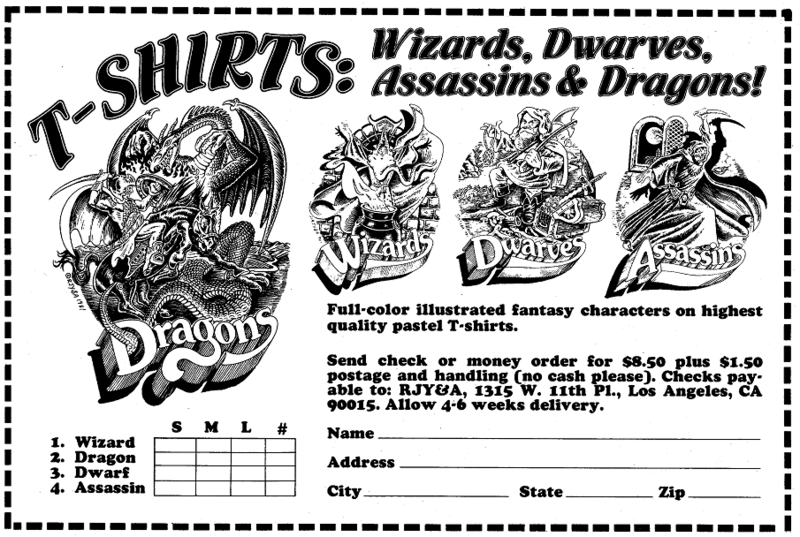 This is what made AD&D great. 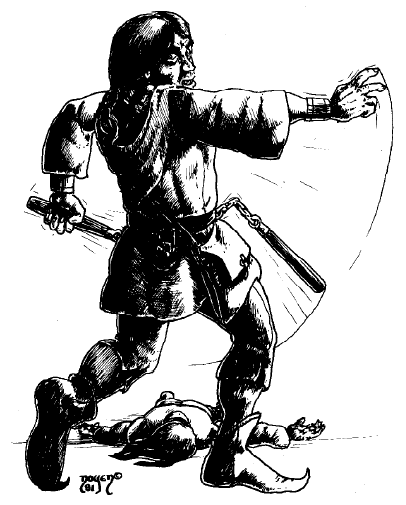 Cool article with NPC stats for some bad boys of the Water Margin. They include Kung Sun Sheng (“Dragon in the Clouds”), Tai Chung (“The Magic Messenger”), Chang Shun (“White Stripe in the Waves”), Li K’uei (“The Black Whirlwind”) and Shih Hsiu (“The One Who Heeds Not His Life”). This is followed up by a Giants in the Earth covering E. R. Eddison‘s Four Lords of Demonland. Notes: Jabberwocks mature as do dragons. They have a fearsome gaze (creatures less than 4+1 HD; frightens; frightened creatures must pass a second save or be paralyzed with fear for 2d4 rounds). Tail attacks anyone behind the creature, with a -2 penalty to attack. 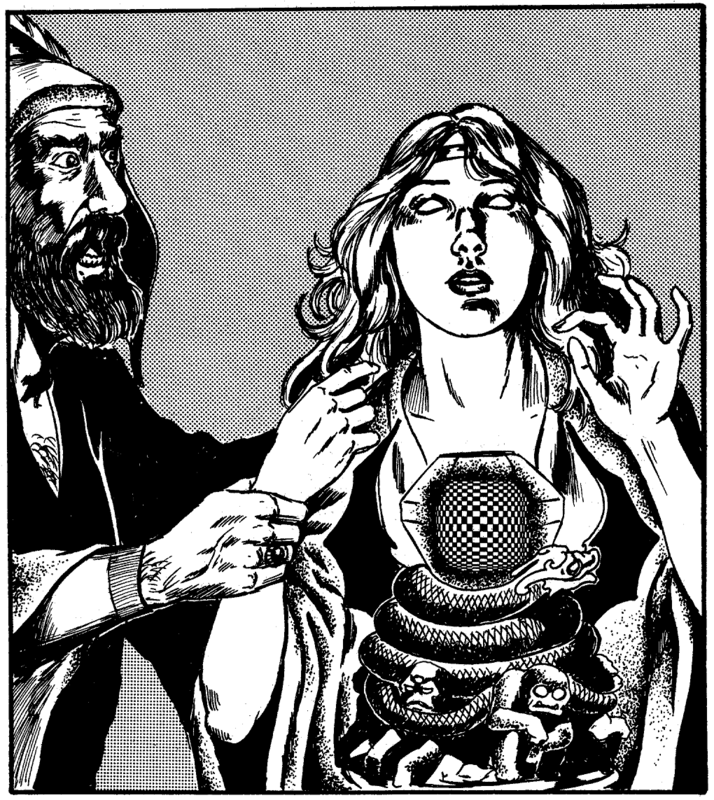 Worth mentioning this module for AD&D, which is also a sort of quiz with a system for scoring. It’s strange, but probably worth checking out, especially if you want to prove you’re better at AD&D than a friend … or foe! Each room gives you a number of options, usually preparations and actions. Based on your choices, you score points and prove your superiority over other dungeoneers. Cavern Quest could be a fun thing to run on G+ using the polling function, but it is probably too long to make it work. 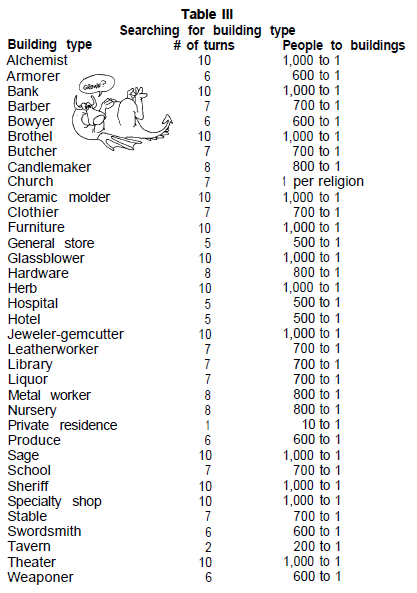 If you need some price lists for an Old West game, this is worth checking out. I wish I’d seen it before writing GRIT & VIGOR. A magic item in the Bazaar of the Bizarre. It is basically an efreet bottle that spews [01-20] a ghost, [21-35] banshee, [36-55] 1d3 spectres, [56-70] 1d2 vampires or [71-00] 1d6 wraiths. 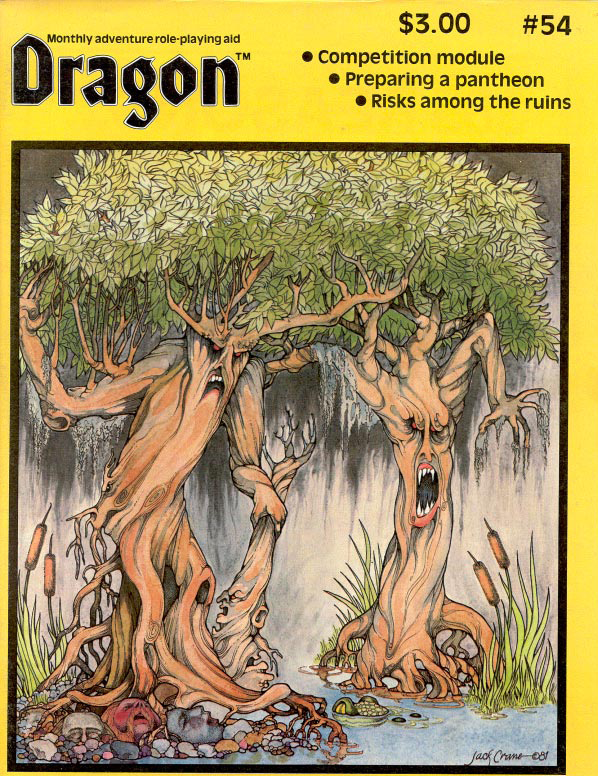 Glory be – I finally have enough time this weekend to do another Dragon by Dragon, this one on issue #53 from September 1981. The first thing I noticed about this issue was the cover. This was not an issue I had as a young nerd, but the cover painting by Clyde Cauldwell, which makes it seem very familiar. 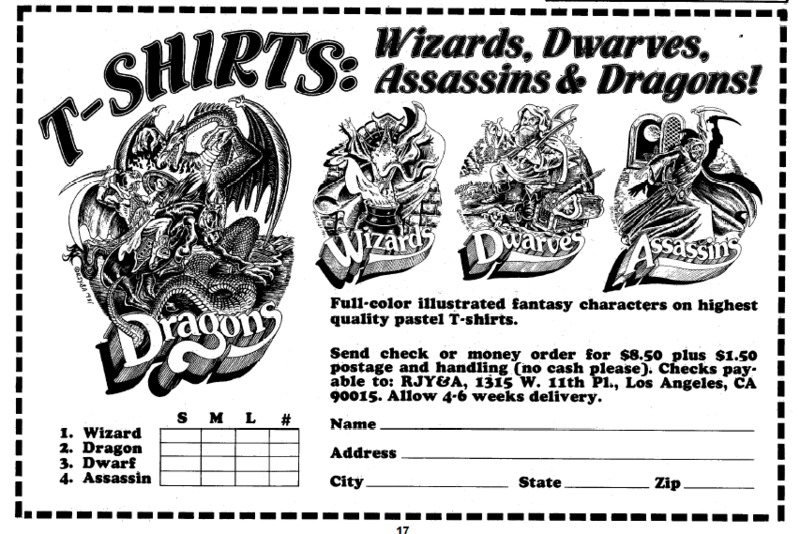 I started playing D&D in 1984, introduced by a friend, Josh Tooley, in 6th grade. He watched his older brother play with some friends, and so with a hand-drawn map on notebook paper, a d6 and a vague recollection of what went on, he ran me through a dungeon during recess. I was hooked, and convinced my parents to get me the game – in this case Moldvay Basic purchased at Toys ‘r’ Us – for Christmas. Good times. So, let’s see what TSR had to offer 35 years ago. One of the best things about these magazines in the old days were the advertisements. All these games – and God knew what they were – with all this art. It was all so new to me when I was a kid. Take this ad from I.C.E. 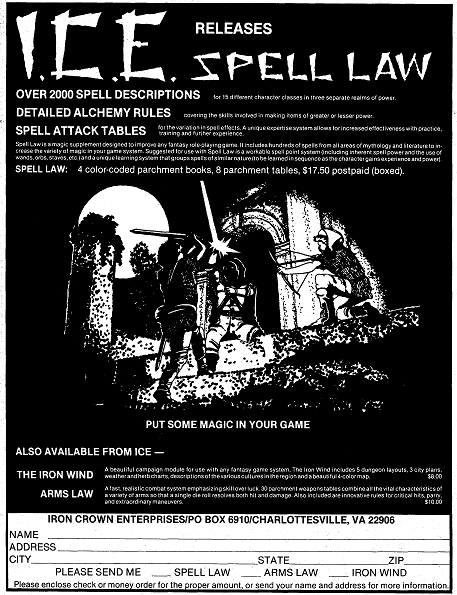 I never had any of their games, but I always admired the art in the adverts – and can you have a cooler name for a company than Iron Crown Enterprises? I remember back in 7th grade some kids running T.A.G. – The Assassinatiom Game. All who participated had to draw the name of another player and kill them – which meant pointing at them and saying “bang”. The victim would then hand his slip over to his assassin, and so it would go until the game was over. Alas, but 2nd period it was all over – a couple morons tried to assassinate their victims in class, and the administration called the game off. I suppose now we would have all been expelled. “Why Isn’t This Monk Smiling?” by Philip Meyers brings up the shortcomings of the monk class, and tries to improve on it. The point is actually well made – the idea of suffering through many very weak levels to be powerful at high levels may appear balanced, but it doesn’t work well in practice. To fix things, Philip introduces a new level advancement chart, plays with the rate at which the monk improves its abilities, and adds some new special abilities, some of them psychic. He also makes it easier for the monk to hit those higher levels, without always having to fight another monk. The monk isn’t out of the fire yet. Steven D. Howard writes in “Defining and Realigning the Monk” a few questions and answers about the monk, mostly to cover why they can’t do some things (answer – I guess it wouldn’t be lawful) and how to once again handle the whole limited number of monks over 7th level. This issue’s Sage Advice keeps the hits coming, with more discussion of the good old monk. Dude – I had those. Still have some of them, as a matter of fact. Love that packaging, and I always dug that logo. Next up is Andrew Dewar’s “The Oracle”. This character class always seems like a obvious choice for gaming, but because it deals with the future (which turns out, it is not possible to predict), pulling it off is always tough, both in terms of the abilities, and making it a playable class. 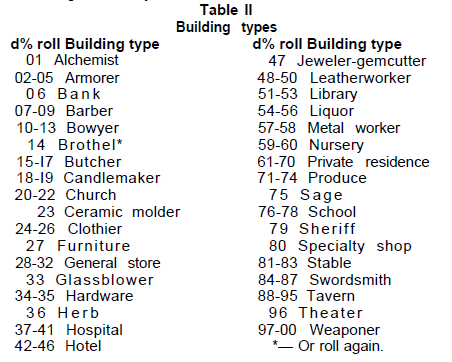 Of course, the oracle here is an “NPC class”, meaning not meant for players, but we all played them anyways. The oracle can cast divination spells, and can use some other divination abilities. It must have an Int and Wis of 14 or higher. Oracles can be human, elf or half-elf. Advancing beyond 11th level requires the oracle to challenge a higher level oracle to a game of riddles (which makes no sense if this is an NPC class … and there is actually half a page spent discussing advancing in level over 11th level). The innate abilities are various forms of divination – rhabdomancy, arithomancy, etc. – which the class has a percentage chance of using successfully at different levels. Lewis Pulsipher has a nice introduction to heraldry in “Understanding Armory”. It’s a great primer for those interested in the subject. 1. Cross-universal caves – always go from one world to another. 2. Teleport chains – a length chain of a weird metal that, when surrounding a group and the ends joined pops them into another world. Judith Sampson has a really interesting article called “Adventuring With Shaky Hands”, in which she describes playing the game with choreo-athetoid cerebral palsy. Worth a read. Prince Vladimir I, The Saint, is a LG 13th level fighter in +5 chainmail with a +3/+4 broad sword. Ilya Muromets is a LG 20th level fighter – a Cossack with long blond hair – with a mace that scores 2d10 damage. He also has stats for Baba Yaga, though I don’t know how they compare to the later version in the famous Dancing Hut adventure. 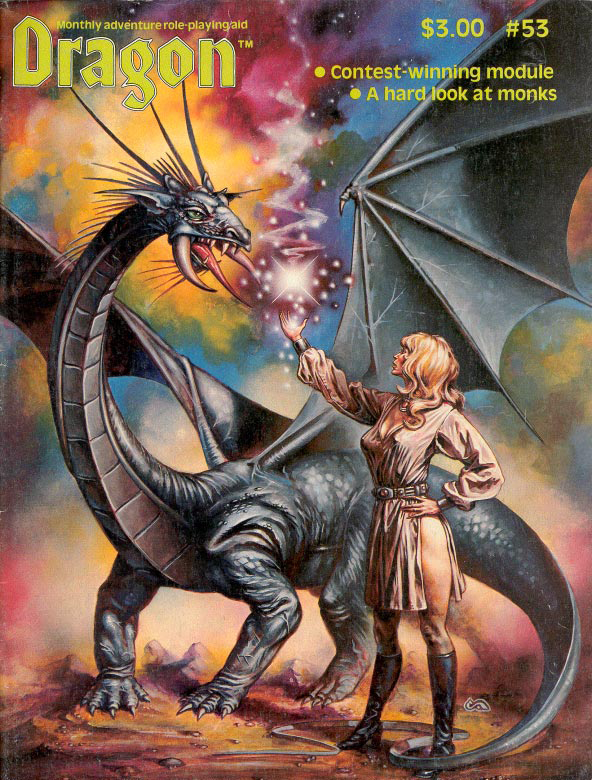 Speaking of adventures, this issue has “The Garden of Nefaron” by Howard de Wied. This adventure won first place in the Advanced Division IDDC II, so it has that going for it, which is nice. This puppy includes some wilderness and a dungeon, and is meant for a large group of relatively high level characters. 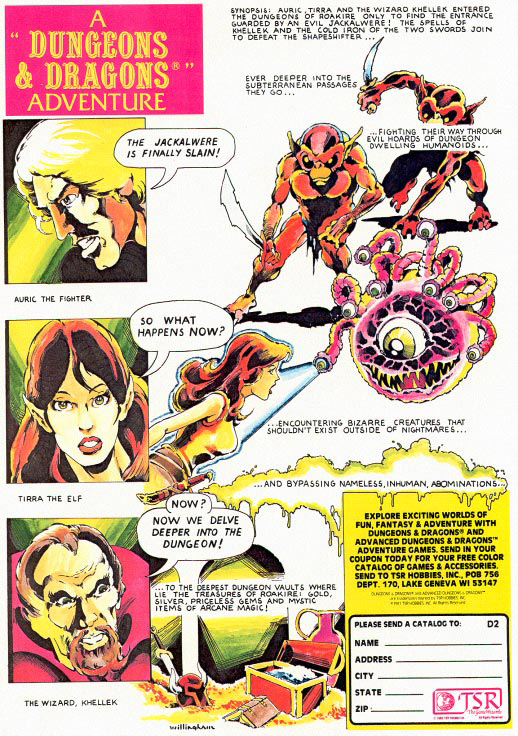 It also includes some nice Jim Holloway art, one of my faves. The dungeon has a ki-rin as its caretaker, there are corridors and rooms filled with magic mists, illusions and a really great map (with Dyson-esque cross-hatching). #53 also has some Top Secret material by Merle M. Rasmussen, with scads of spy equipment. 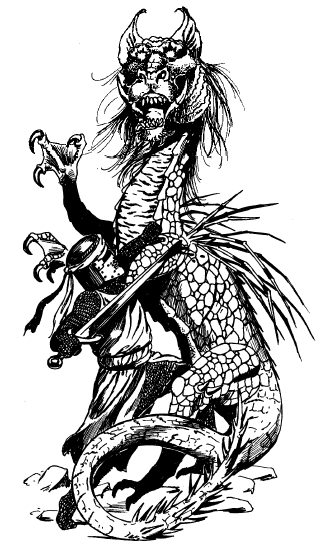 The Dragon’s Bestiary covers Argas (by James Hopkins II), lawful good reptilian humanoids that gain powers from devouring magic, Oculons (by Roger E. Moore), which are enchanted monsters created by magic-users as guardians (and which look super cool) and Narra (by Jeff Goetz), which are lawful human-headed bulls. 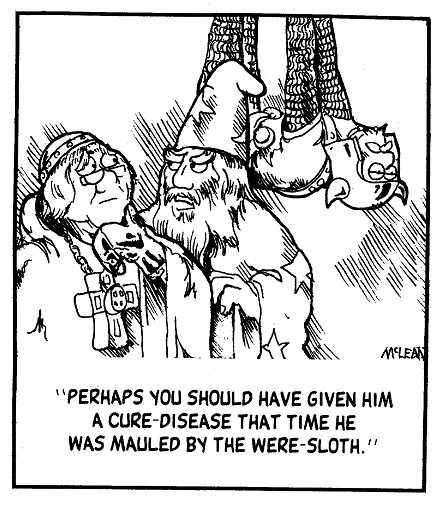 Len Lakofka has some extensive info on doors in his Tiny Hut and Matt Thomas does some work on the AD&D disease rules in “Give Disease a Fighting Chance”. They can hide in foliage with 94% chance of success, and they attack with a stinger. The stinger requires two saves vs. poison. If the first is saved, it means instant death. If the second is failed it means blindness and 2d4 additional points of damage. For the Traveller fans, Dennis Matheson presents “Merchants Deserve More, Too”, which covers character creation for merchants. Another great ad. I’d dig one of these shirts. Apparently a popular name among magic-users. Have fun, guys and gals!